If character can determine destiny, can place determine character? The For Rent Mystery Series is an exciting new cozy mystery series by author Eric James Miller. It follows a young journalism professional, Dana Santoyo, as she moves across the country in her quest to become a network news anchor. The first novel, “For Rent: Dangerous Paradise” is set in weird and wonderful Venice Beach, California as Dana struggles to finish her degree, figure out who killed her best friend and make sense of the psychic visions that haunt her. When a single mother is found murdered halfway between L.A. and Vegas, the odd residents of the creepy apartment building where she lived are put under the microscope by two detectives and the woman’s neighbor, journalism student Dana Santoyo. Set in Venice Beach, California, the story moves through the apartment building unit by unit, chapter by chapter, revealing each resident’s unique point-of-view and the dark, personal secrets they’d rather keep hidden. In this beautifully eclectic, deadly world of deceit, lust and greed the simmering rivalries and secret passions of the interconnected group of neighbors breathe new life into a simmering, long-forgotten Native American curse. As the body count rises, Dana realizes that being the next target on a killer’s list isn’t nearly as terrifying as being cornered by a haunted past. January 2014: “Serena’s Story” – a novella told from a murder victim’s point-of-view during the three days leading up to her death. February 2014: “The Ghost of John Bartlett” – a short story about an admirable, hard-working pioneer who arrived in Las Vegas in the early 1900′s and met an unfortunate end right after he fell in love. Summer 2014: “For Rent: Haunted Neon” – the sequel to “For Rent: Haunted Paradise”. 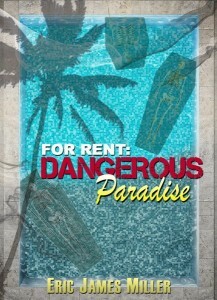 Book One in the series, “For Rent: Dangerous Paradise” is set in Venice Beach, California. It introduces spunky young journalism student Dana Santoyo as she struggles to make sense of her introverted past, the lurking shadows in her apartment and the unsolved murder of her neighbor, Serena Andrews. In Book Two “For Rent: Haunted Neon” Dana’s budding journalism career takes her to Las Vegas, where she finds herself living in another place with a dark past, a old, run-down, week-by-week motel hiding in the neon shadows of the glamorous Las Vegas Strip. In Book Three, Dana finds herself caught between corruption and the ghosts of the past in a small Alaskan supply town. It could be … right next door in your own hometown. now published by Castle Horse Press. One Response to Welcome to the homepage of author Eric James Miller!